During his August 5, 2015 speech at American University, President Obama urged resisting "the drum beat of war." 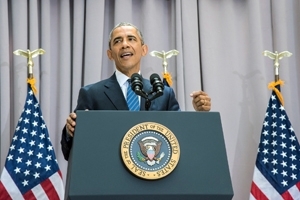 In a gutsy speech on Wednesday, August 5, at American University's School of International Service (SIS), President Obama made the case for the Joint Comprehensive Plan of Action (otherwise known as the Iran deal)—a diplomatic agreement aiming to prevent the Islamic Republic of Iran from acquiring a nuclear weapon. "The choice we face is ultimately between diplomacy or some form of war," said the president. "Maybe not tomorrow, maybe not three months from now, but soon." President Obama started off by comparing today to circumstances in 1963. "Fifty-two years ago, President Kennedy, at the height of the Cold War, addressed this same university on the subject of peace," he said, noting that at the time, "the prospect of nuclear war was all too real." The Berlin Wall had just been built, the Soviet Union possessed the most powerful nuclear weapons, and China was on the verge of acquiring a nuclear bomb. The president proceeded to outline how Kennedy's diplomatic approach succeeded and set the stage for future diplomacy surrounding the acquisition of nuclear weapons in the Soviet Union. Not every conflict was avoided, but nuclear catastrophe was. "The agreement now reached between the international community and the Islamic Republic of Iran builds on this tradition of strong, principled policy diplomacy." During the next hour, the president advocated for the deal as not just the sensible, diplomatic resolution that would prevent Iran from ever acquiring nuclear weapons, but really, the only alternative to war. "Congressional rejection of this deal leaves any US administration that is absolutely committed to preventing Iran from getting a nuclear weapon with one option, another war in the Middle East," he said. "I say this not to be provocative, I am stating a fact. Without this deal, Iran will be in a position, however tough our rhetoric may be, to steadily advance its capabilities." Without the deal, President Obama said that what brought Iran to the negotiating table—the multilateral economic sanctions from the US, China, Russia, France, the United Kingdom, Germany, and the European Union—would unravel. "US rejection of the deal would be a severe blow to US credibility," said James Goldgeier, Dean of AU's School of International Service. "It would leave US businesses looking on from the outside as the Europeans, Russians and Chinese rush in." And while the president emphasized the negatives of military action—the most recent being the War in Iraq—he repeatedly extolled the virtues of diplomacy, citing the resolution of the Cold War as the ultimate example. "The Cold War was much more dangerous," agreed Goldgeier, whose expertise includes US-Russia relations. "The Cold War was a global struggle that was military, political, economic, ideological, and diplomatic. The Soviet Union had the capacity (as Russia still does) to obliterate the United States with nuclear weapons as we could do to them. Iran is a regional power with regional ambitions—dangerous yes, but not the Soviet Union." Aria Chehreghani, an Iranian-American and first-year SIS grad student from North Potomac, MD, is one of the lucky AU students who witnessed President Obama deliver the speech today. "It was truly a blessing to have witnessed such a historic speech," he said. "President Obama delivered his case for the Iran deal in such a passionate tone that left me with goose bumps. The first class I'll be taking as a grad student is public diplomacy, so I'm ecstatic to learn and discuss how crucial diplomacy is in foreign policy." Below: check out the edition of "West Wing Week" mentioning President Obama's August 5, 2015 speech at AU. Chehreghani is far from alone in his zeal for diplomacy. One could say it is the AU way. American University President Neil Kerwin referenced it in his introductory remarks at today's event. "Our campus is a place where different cultures, perspectives, and points of view are discussed with passion and civility," said Kerwin. "That is a core value… that we practice and protect. That is why American Presidents and other world leaders come to our campus to test ideas, make policy statements, and create change." Carola Weil, Dean of AU's School of Professional and Extended Studies and an expert on foreign relations, said diplomacy has a successful track record and despite naysayers, Americans will support it. "History and research have demonstrated time after time that when the American public is fully informed, there is much greater support for multilateral engagement such as we have seen in the case of the Iran treaty negotiations." At several points the president's speech drew applause from the audience of 250, including in response to a remark in which he agreed with those who oppose the Iran deal. "What's more likely to happen should Congress reject this deal is that Iran would end up with some form of sanctions relief without having to accept any of the constraints or inspections required by this deal," the president said. "So in that sense, the critics are right. Walk away from this agreement and you will get a better deal—for Iran." But Pedram Partovi, an assistant professor of history at AU and an expert on modern Iranian history, says there are indications that Iran has interests in the deal beyond relief from the economic sanctions. "Iranian leadership is taking a more pragmatic and realistic approach to the current political situation in the Middle East," Partovi said. "For some, any cooperation or coordination with the Americans is considered a violation of revolutionary principles. But there are also those in prominent positions in the Iranian government who understand that there are issues of mutual concern and that cooperation with the US and its allies may be helpful in resolving those issues." Some of these issues are ISIS and other Sunni extremist groups in Syria and Iraq. But Hezbollah is not one of them as noted in the president's speech. "Iranians view Hezbollah as a Lebanese defense force against Israeli aggression rather than a terrorist entity," Partovi explained. Israel, the strongest US ally in the Middle East, has vehemently opposed the deal at every turn. President Obama addressed how he is squaring US-Israel relations with what he believes is his presidential duty. "I believe the facts support this deal. I believe they are in America's interests and in Israel's interests," he said. "And as President of the United States, it would be an abrogation of my constitutional duty to act against my best judgement simply because it causes temporary friction with a dear friend and ally." The time and location for the president's speech was of particular importance. Not only is AU where President Kennedy delivered "A Strategy of Peace," but today is the 52nd anniversary of the US, Soviet Union, and the United Kingdom signing the Limited Nuclear Test Ban Treaty—the agreement foreshadowed by "A Strategy of Peace." August 5 is also one day before the anniversary of the first use of an atomic weapon—the bombing of Hiroshima, Japan on August 6, 1945. This year marks the 70th anniversary. Read story about Hiroshima's 70th anniversary. "John F. Kennedy cautioned here more than 50 years ago at this university that the pursuit of peace is not as dramatic as the pursuit of war," President Obama said in his closing remarks. "But it is so very important. It is surely the pursuit of peace that is most needed in this world so full of strife."